This Kurt Adler 12" Hollywood Clara Nutcracker is a fun, festive way to add to your holiday décor or nutcracker collection. Designed by renowned artist Holly Adler, Hollywood Nutcrackers is a whimsical collection of nutcrackers created exclusively for Kurt S. Adler, Inc. and features an assortment of characters including Christmas, fantasy and everyday nutcrackers. Their designs put a unique, vibrant, memorable twist on traditional nutcrackers. 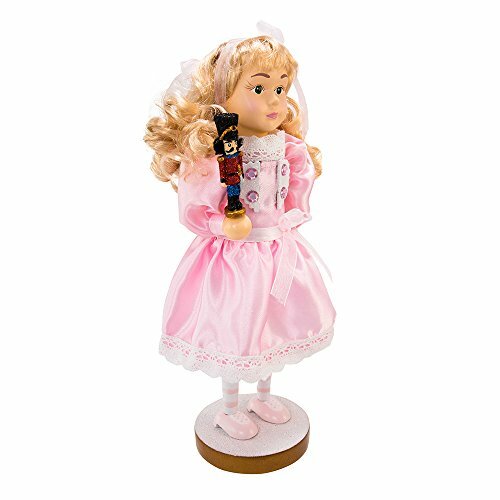 This nutcracker features the star of "The Nutcracker Suite," Clara, with her long blonde hair, blue eyes, and pink dress with white lace detailing. Like the story's character, she is holding a beloved nutcracker of her own, which is wearing a sparkling blue uniform adorned with gold detailing at the shoulders, red pants, black boots, and is holding a tiny sword. Exclusively for Kurt S. Adler; Inc.